Should I hit “publish”? Millions of complete strangers are going to read what I’ve just written… is it really a good idea to get so personal? Someone could twist the meaning of my words, or I could unintentionally offend someone. What if I’ve worded something poorly and it comes across in a way I didn’t intend? There’s still time to back out! This was me on Monday, before sending the Chocolate Covered Katie Anorexic? post out into the world. Close eyes. Hit publish. Can’t back out now. Whenever I publish a post, I try not to think about anyone reading; I try to pretend it’s back in the old days, like when I wrote my very first blog post and had exactly zero readers aside from myself. And maybe my dog. Anyway, the worry was unfounded in this case. I’ve never been so moved by a response to a blog post as I was on Monday. Turning on the computer and seeing the kindness from readers around the world who took time out of their day to message someone they’d never met was so heartwarming. Hopefully this post does not sound too sappy… I can’t seem to find the right words for just how grateful I am for the support, compassion, and love. You all mean the world to me. I hope you know that. Now I’ll stop talking for a while, and—true Italian that I am—will instead express my gratitude through food. 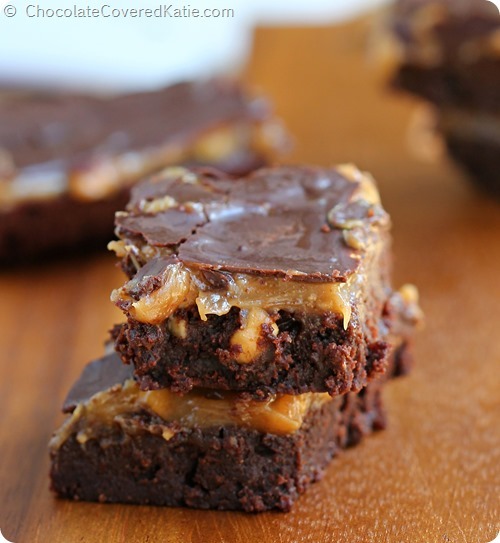 These Chocolate Peanut Butter Buckeye Brownies include many of the foods I love most in the world: peanut butter, chocolate, brownies, and… is there even anything else? Those are the only foods that matter, in my extraordinarily-humble (and not-at-all-biased) opinion. 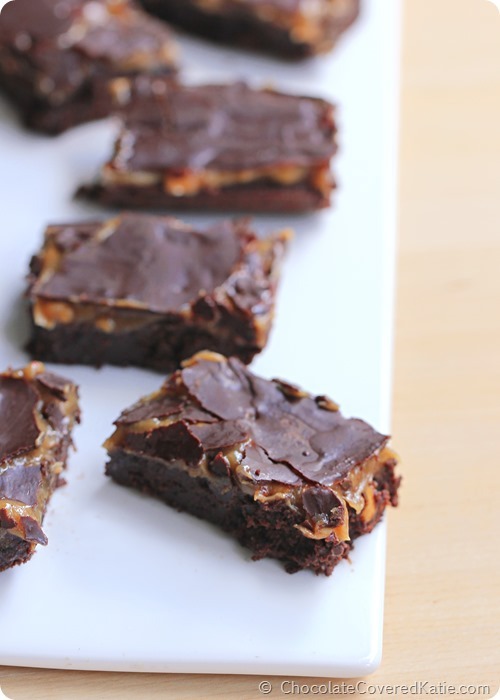 Thank you again for your kindness towards me… And enjoy the buckeye brownies!! I only wish I could make and send them to you for real! If you could choose just ONE favorite food to eat for the rest of your life, what would you choose? Such a tough question! I’m not sure what my absolute favorite food would be! Oh wait… Yes I am. Oh wait… Yes I am. Stir together all ingredients until a thin sauce forms. If sauce is too thick, gently heat until thin. Spread evenly over the brownies, then immediately put back in the fridge to harden the coating. 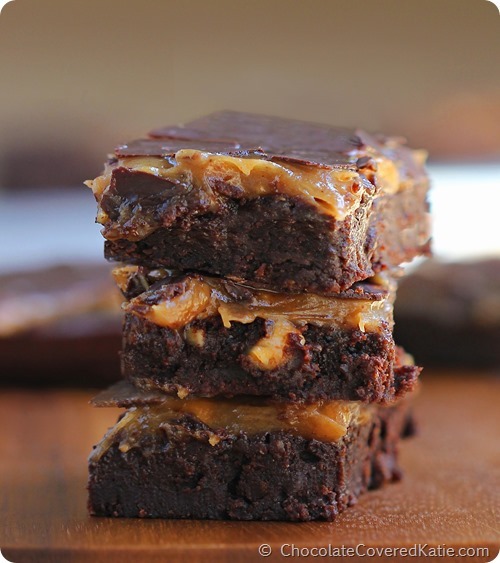 Once hard, you can cut the brownies. My trick is to cut brownies with a plastic knife, wiping the knife after every cut. Store leftovers in the fridge, or they are actually really good frozen as well! « Chocolate Covered Katie Anorexic? I’m glad you’ve had an overall positive response to your last post! As always, these look delicioussss! Peanut butter and chocolate the best food combination known to man!!! 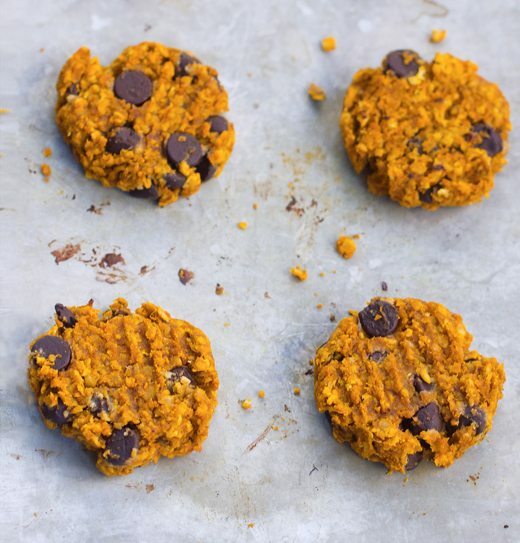 😉 Love that you used spelt flour… that is my favorite healthy flour to bake with. I’m also really glad that you hit publish on your previous post. I sure hope that your post puts all of those hurtful rumors to rest. Oh my gosh, you need to stop posting so many delicious recipes because I don’t have the time to try them all out. I’ll be adding this one to the list of things that I need to make and until that can happen I’ll just be sitting here staring at the beautiful photos on my screen. Yum!! I think I would have to agree w/ you on the pizza – as long as I am not restricted on the toppings! There are so many options of toppings (even dessert!)!!!! 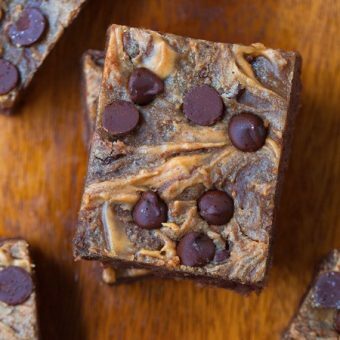 Can’t wait to get home and try these brownies – no oven in my travel trailer 🙁 . These look to.die.for. 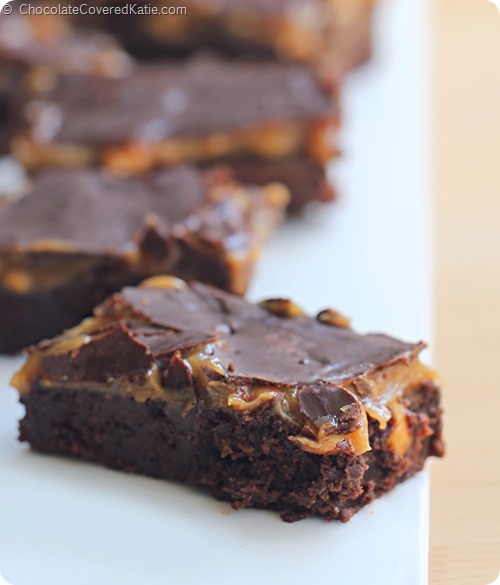 I love gooey brownies! 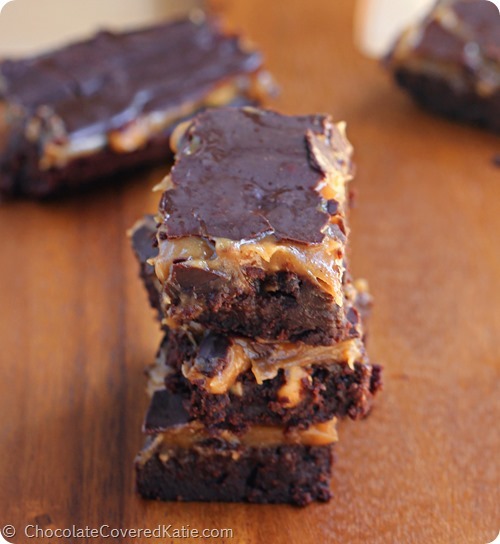 PB and chocolate, you can’t go wrong. Oh man….I wish you COULD mail them over! I’d gladly pay that postage. Oh well, I guess this means I’ll have to take matters into my own hands (literally). This recipe was more than enouh thanks. It looks mouthwatering! 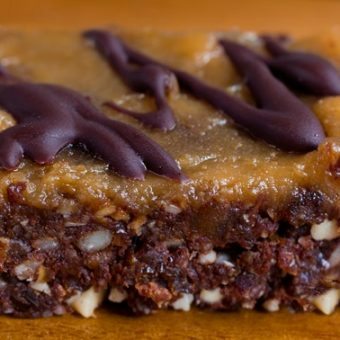 If I could only eat one thing….hmmm….it might be raw creamy almond butter, cashews, or mushrooms. Really, I’m just nuts for nuts like that bird is cuckoo for Cocoa Puffs. If I didn’t have to worry about my weight, I think I’d go with chocolate, for sure. Especially chocolate covered things. A chocolate bar is so much better when it has fruits and nuts in it. Looks fabulous. Just wondering if you generally calculate nutrition info including sugar or stevia? Thanks! 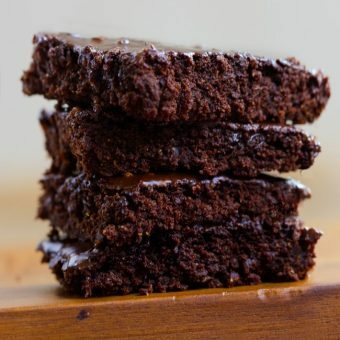 I was just going to repeat a recipe of nutella peanutbutter brownies which I had made two weeks ago, no I changed my mind and will try these, they sound too delicious! PLEASE let your readers know exactly what final ingredient YOU put into these delicious looking recipes! The milk of choice, all purpose flour or Bobs gluten, the sweetener of choice, vegetable oil or coconut oil… etc, etc … All of these in many different combinations make for many different final results, tastes and textures! So which are you using in the end? You don’t make that clear! Please… As I said you have a some coffee clutch mom fans here hoping you are more clear on YOUR final result of specific ingredients used when showing the lovely photograph of said finished product! Thanks ! Personally, seeing recipes divided into gram-size servings isn’t very helpful to me either, because let’s face it, who’s really going to plop a scoop of ice cream onto a food scale to weigh it (and moreover, who’s going to scoop some of that ice cream back into the container if it goes over the serving size?)?! Same thing with tablespoons– so maybe you could put something like “Makes eight 15-gram servings or roughly 8 tablespoons” instead. And I totally get what Mary is saying about the different textures, etc., of the finished product– for instance, if the only change you make in a cupcake recipe is using applesauce instead of pumpkin, the resulting cupcakes are a LOT fluffier with the applesauce than with the pumpkin. Different flours definitely affect the final outcome too, so a little more input on the finished product would be helpful as well, even though you’ve said before that you never put alternatives into a recipe without having tested them first– we’d just like to know how using each specific alternative affects the final result! Again, I appreciate the effort you put into your recipes and providing the nutritional data and alternatives, but taking one or two more (small) step(s) would be very beneficial to many of your readers! If an option is listed, please rest assured that means it has been tried. 🙂 Most of my recipes will go through a trial with spelt flour, ap flour, and gluten free flour. (I have a friend who often does the gf option trials for me.) Same thing with the sugars; if it’s a recipe that has a stevia option and one that calls for pure maple syrup, both will have been tried before posting. For milk of choice, I use Silk almondmilk. Hope that helps! Katie, We live on opposite sides of the country, but I really wanted to let you know I appreciated your post yesterday. Your openness and honesty are refreshing. When I look at your pictures, I see someone who is beautiful and healthy. I also wanted to let you know I appreciate you including the Weight Watchers point values in all your recipes as I am on the points plus plan and it really gives me license to enjoy. Everything you post is totally worth the points they cost! I’ve made your Samoas cookie/bars twice now because my kids scarfed down the entire first batch. 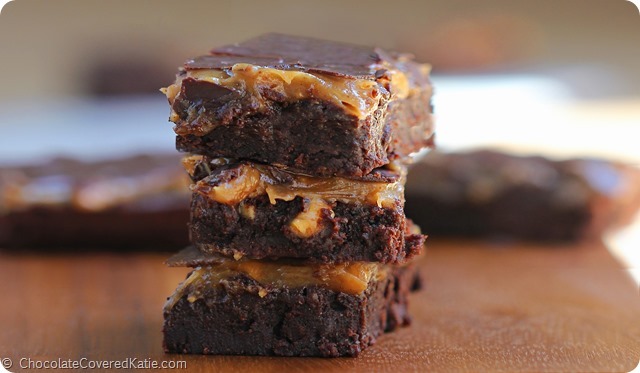 I’m looking forward to trying these brownies…the pictures make my mouth water! Agree – I LOVE the weight watchers points plus! Until I get to a healthy weight, I have to watch these carefully. Once there, I can just go with a eat healthy and portion control method and hopefully not have to count anything. 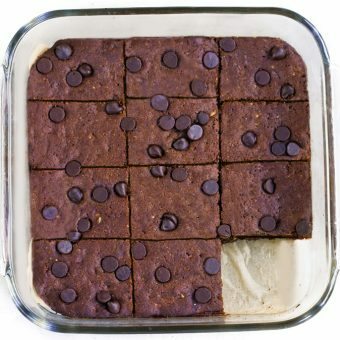 This healthy dessert blog really does help me stay on point, as it is. Funny! I can soooo appreciate your feelings about hitting the publish button. I go through the same thought process. And then, I too, remind myself that I have few followers, so my chance of offending anyone is quite slim! Anyway…I totally appreciate your honesty and your willingness to share yourself with others. That is the reason I follow you. You are real to me! Do you have any new updates for us on your cookbook? I’m so excited for it! I get NuNaturals stevia either online or at Whole Foods. These look so so so good! I didn’t get a chance to comment on it but your post was awesome and I give you major props for standing up to the rumors. You go, girl!